Why ‘Doing Everything Right’ Doesn’t Insulate Women From Single Motherhood. 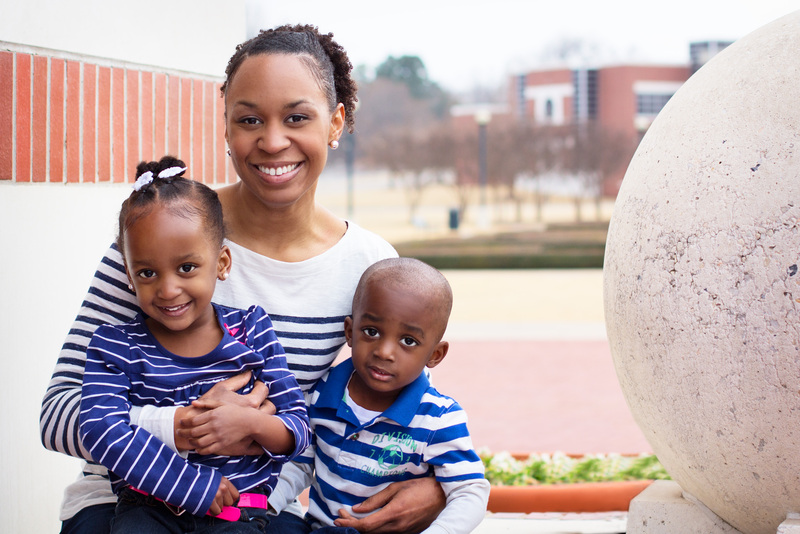 Professor Jen Jamison, with her gorgeous three-year-old twins. Where I began my story as a single mother was at a time in my life when I felt like I had done everything the right way and in the correct order. I graduated from high school at the age of 18, followed by a bachelor of science degree in chemistry at the age of 22 and a Ph.D. in chemistry at the age of 28. During my postdoctoral training, I met someone who I felt loved me, supported my dreams, and wanted me to support his dreams. He was everything I thought I wanted. He did a lot to impress me and I did my best to reciprocate all of his efforts. We had a great time together. This whirlwind romance was followed quickly by engagement, marriage, and pregnancy. That’s when the wheels came off the proverbial cart. All of sudden, instead of being loving and supportive, he became emotionally abusive and threatened and actually performed physical violence on numerous occasions. Instead of him showing me off to his friends, he would tell me I was nothing. I thought about leaving the marriage, but I was also pregnant…with twins! I figured things would calm down after we graduated from the newlywed stage. I made a marital vow and I intended to keep it. I eventually became a shell of my former self; I was broken, humiliated, and mistreated frequently. In October of 2010, my son and daughter were born at 33 weeks and stayed in the NICU for nearly a month. I also had a one-week hospital stay, which gave me time to decide to leave the marriage and formulate an exit strategy. I was laid off from my postdoctoral position around the time the babies were born. I had dreams of becoming a college professor and submitted applications to several schools around that same time. Since most universities do not hire until around August, I knew I would be unemployed for many months. Here I was with no job, a new mother to twins, and a plan to fix my life. I was still married and living with my husband, and everything was manageable until the babies were released from the NICU to come home. Because they were preemies, I had to stick to a strict schedule of feeding them, which was every 2-3 hours, 24 hours per day. It was very difficult manage this with absolutely no help from anyone else. I went to stay with my parents for a while so I could get help with the babies. While there, I got job interviews and continued to apply to other universities. My parents helped me by taking care of the babies while I was flying to other states for job interviews. I eventually narrowed my job offers down to two universities: one in the same city as my husband and the other in another state. Long after I signed the contract with the university in the other state, I informed my husband that I was leaving. He kept most of my belongings, which were acquired long before I met him. I basically moved to another state with 9 month old twins and a few possessions in July of 2011. We moved into a duplex on the not-so-great side of town. I didn’t even have a television or cable. Despite living simply, being in my new place was great because I was able to begin to recover from all of the abuse. When August of 2011 rolled around, I was so excited to begin working as a college professor. I loved my university, my colleagues, and my students. I was also nervous because I had no family nearby to help with my kids. I was so nervous about them getting sick and having to miss work that I expressed my concern to my boss. His response: “If you need to miss work, your colleagues will help cover your classes. Worst case scenario, if you can’t be there, cancel class! You are the professor, after all!” I was able to breathe again, to smile, to laugh, and to make friends. For the first time since 2010, I had a positive plan to move my little family forward, including home ownership. I finally saved up enough money in 2012 to get a divorce. The whole process was pretty straightforward and I became a free woman on July 6th of 2012. I didn’t have time to cry or have any emotions because I knew that there was nothing to cry over. Also, I was too busy packing and getting ready to move into my brand-new home that was built from the ground up; I moved into my home on August 1, 2012. There was new furniture to buy and other first-world problems to solve such as finding a reputable lawn maintenance company. These days, I am happy with myself and my accomplishments as a mother and career woman. I appreciate the fact that I have overcome some huge difficulties, yet I am still standing. I have raised my twins by myself since their release from the hospital; they are almost 3 ½ years old and my love for them continues to grow. I love that I have a job that seems custom made for me. Most importantly, I have learned to lean on God and trust His ability to make all things work together for my good. I assumed that since I did everything “right,” bad things weren’t supposed to happen to me. While I do not wish single motherhood on anyone, I recognize that it can happen to anyone, regardless of race, education, or socioeconomic factors, for any reason. It doesn’t matter how one becomes a single mom; if it happens to you, you will have much greater concerns than who is judging you. Yes, the stereotypes are alive and well, and some people are not as graceful in keeping their opinions to themselves. I can’t control them any more than I could stop my ex-husband’s mistreatment of me. I just make sure I remind myself that being a single mom does not remove or diminish my desire to give my children the best upbringing that I can give them, which is the same desire held by other types of mothers for their children. Finally, I remind myself that I love my children and always will, which keeps me going when I become exhausted from taking on too much at work. Their hugs infuse me with energy and their smiles and giggles confirm that every ounce of labor, stress, and discomfort is completely worth it. Jen Jamison is a mother of 3-year-old twins and a chemistry professor at a university in Arkansas. She is also a writer, a speaker, and an enthusiast for science education at the K-12 level. Posted in Class and Money Matters, Community Bloggers, Community-Building. Tagged divorced mothers, emotional abuse, mothering while pursuing higher education, overcoming stigma, post-divorce parenting, single mothers, single mothers of color, single mothers of twins. Previous: Previous post: Beating Shame, Staying Trill. Next: Next post: ‘The Single Moms Club?’ Thanks, But No Thanks. Thanks for sharing your story. You’re such an inspiration. Thank you for your story. Believe it or not, it is going to help me be stronger with a situation I’m in right now and that’s an a verbal abusive alcoholic. I was thinking because I am Christian and the alcoholism is being said it’s a disease that I needed to stay. The bad times are 98 percent of the relationship when there’s one because you are not actually having a conversation with someone that can’t remember it no matter if it seems like a good one. Ok I’m ending now, Bless you and your family and congrats on your new found peace and freedom.